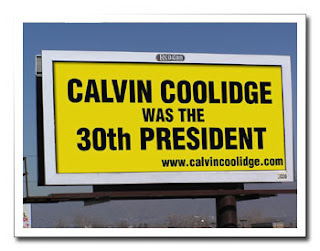 I was struck by a recent story about Calvin Coolidge, the 30th president of the United States who was said to have, among other things, curbed outdoor advertising. The Calvin Coolidge study has subsequently reproduced many with similar effect. While Coolidge may have been cool on outdoor advertising, and cool in general, he was one of the first national politicians to make extensive use of radio and film media. He gave a record 529 press conferences; his inauguration was the first presidential inauguration broadcast on radio; he was the first President whose address to Congress was broadcast on radio; and was the first President to appear in a sound film. I’d be curious if anyone knows why Coolidge tried to curb outdoor advertising and what effect this had on the industry. Drop a comment if you know.